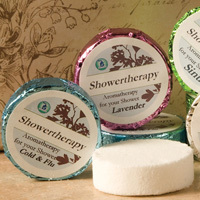 Shower Therapy Aromatherapy Tabs are aromatherapy for your shower! When you don’t have time to relax in a hot bath, start your day off right with these invigorating Shower Tabs! Just place a Shower Therapy Aromatherapy tab on your shower floor away from the stream of water. The steam of your shower will release the Essential Oils. Happy Citrus – the wonderful blend of citrus essential oils – will certainly get your day off to a happy start. Feeling a little stuffy? Cold season is right around the corner and the Sinus and Cold/Flu Therapy Tabs made with Thyme, Menthol, Eucalyptus and Lavender Essential oils will help bring much relief. They also make great stocking stuffers! Buy Shower Tab Steamers Here!